We all have one. That run. Its physical location may change as we move house, region, country, continent. But it is the run that is always with us. It is the run that we can trust ourselves to. It is the run that is waiting to enfold us back again after injury, absence or discouragement. It is where we go in the cool of the early morning, in the heat of the day, in the fading light of a setting sun. It is a place we go to in all seasons, observing and feeling the changes, until the rhythm of the earth becomes our own, a comforting reminder of the impermanence of all things. It is where we go to seek solace, to seek challenge. It is where we go when we need to push, to hold back. It is where we go when we need to find a fragile peace. I step outside. Lock the door behind me. Legs feel heavy. I have that morning time post sleep tiredness, despite the coffee. I lift myself onto my bicycle. 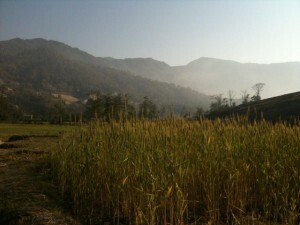 It is my lifeline, the conduit that channels me between the chaotic streets of Kathmandu and the freedom of the hills. Kathmandu is a city that assaults your senses with its multitude of sights, sounds and smells. It is a city of poverty, a city of riches, a city of contrasts and contradictions, but a city where life has a beauty of its own, played out in front of you on the street, with a ‘namaste’ and a smile. The cycle jolts me out of morning inertia and the tide of life sweeps me along with it until the city has dwindled into the paddy fields at the foot of the Shivapuri hills. Bike locked, I start slowly. The legs, the body take their time to ease into movement. But even with the first step I’m shaken into a stillness. The turmoil of emotion that permeates our every day – the doubts, the fears, the hopes, the apprehensions, the joy – is held in suspension. There is a quiet within my movement. I think. But my thoughts are not my master. For the moment I am simply running. Identity and purpose are irrelevant. To be running is enough. Because if I am running then I am alive. And to be alive is everything. Today alone. Often times with good friends. This run was once new enough that I would frequently lose myself, but with repetition I learnt to know these paths and trails, until I could run them with ease, without need for concentration or effort. Until I would lose myself again, in a different sense, immersed simply in the pure effort of the run. I know how it will feel beneath my feet, I know where there will be mud even on the hottest day, I know which rocks I will slip on and which not, I know which branch to grab to break a descent or ease a step up. I know it green and lush in the post monsoon fecundity, I know it sparse and dry. There is a beautiful contrast between the quiet of the hilly woods and the cries of ‘hi’, ‘hello’, ‘how are you’ from laughing village children, between the solitude and the dodging of dogs, cows, goats, chickens. It soothes me. It reminds me of my own insignificance and yet at the same time of the fundamental necessity of my existence. It is that run. It is the run that brings me back home; to that still small place within the core of my being where I can sometimes find a fragile peace. Lizzie, thank you for inspiring me.Sometimes i find that fragile peace too. How beautifully written. I’ll by your book .